With network vulnerabilities such as Heartbleed surfacing and high-profile network breaches, companies have shifted their focus toward enhancing their security systems and implementing identity management. Access vulnerabilities that favor data leaks has become of one of the most crucial areas that demands an enterprise’s attention for security today. As a front runner in the cyber security revolution, RSA Security has created powerful connections through its hardware, software, and service offerings that help in developing a secure environment without compromise. Many companies have partnered with RSA to bring security to their clients to combat various levels of cyber threats like Intellectual threats, fraud, network breaches, and other forms of malicious activity. RSA specializes in areas dealing with data security and user-access authentications. RSA’s host of security solutions help organizations reduce the risks encountered by offering tools that provide increased network visibility and threat analysis systems. Through RSA’s partnership program, clients have been able to equip their end-users with the ability to identify, investigate, and respond to security threats. For confirming and managing identities and user access, the RSA SecureID token is the industry maxim today and helps track users and the resources they access. To help CIOs find the right RSA Security Solutions Provider, a distinguished panel comprising of CEOs, CIOs, CSOs, VCs, analysts and the CIO Review editorial board have selected the top RSA Security Solutions providers in the market today. The companies listed here have demonstrated the ability of leveraging Security offerings to develop innovative technologies, methodologies, and provide outstanding customer service. In our selection process, we looked at the vendor’s capability to fulfill the burning need for cost-effective and flexible solutions that add value to the complex RSA Security landscape. 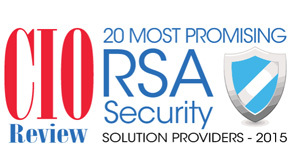 We present to you CIO Review’s 20 Most Promising RSA Security Providers 2015. Above Security Provides customized services for monitoring and protecting critical IT assets in customers’ infrastructures on a 24/7 basis. Alliant Technologies Designs, deploys, and manages global IT infrastructure through scalable Continuous Infrastructure Service. Bit9 plus Carbon Black Providing real-time security solutions against the advanced threats that target endpoints and servers. Entrust Datacard Offers the trusted identity and secure transaction technologies that make anywhere-anytime experiences reliable and secure. Gotham Provides guidance and direction to IT professionals, enforcing solutions to meet compliance objectives through pre-audit assessments or post-audit remediation, and risk management. Gurucul Gurucul uses behavior based machine learning and predictive analytics to monitor network threats and has solutions to protect against targeted and under-the-radar attacks. IXIA A provider of application performance and security resilience solutions to validate, secure, and optimize businesses’ physical and virtual networks. Kerio Technologies A global provider of complete IT infrastructure solutions that allows businesses to connect, communicate, and collaborate securely. Merrill DataSite Provides a complete, secure VDR solution that optimizes the due diligence process by overcoming the many limitations of a traditional paper data room. MessageMedia, LLC A firm that delivers secure and cost-effective security solutions for two factor authentication, partnered with RSA. Network Computing Architects, Inc A quality-driven technology provider of services and telecommunication products for businesses of all sizes. Security Innovation Security Innovation is an authority on software security and helps organizations build and deploy more secure software. Tripwire, Inc Delivers advanced threat, security and compliance solutions. US ProTech Provider of computer network security and federal regulatory compliance management solutions. Varrow Providing world-class information solutions and unparalleled service that enable organizations to rapidly and efficiently achieve their goals and objectives. Ziften Ziften develops Endpoint Detection and Response solutions for enterprises worldwide.